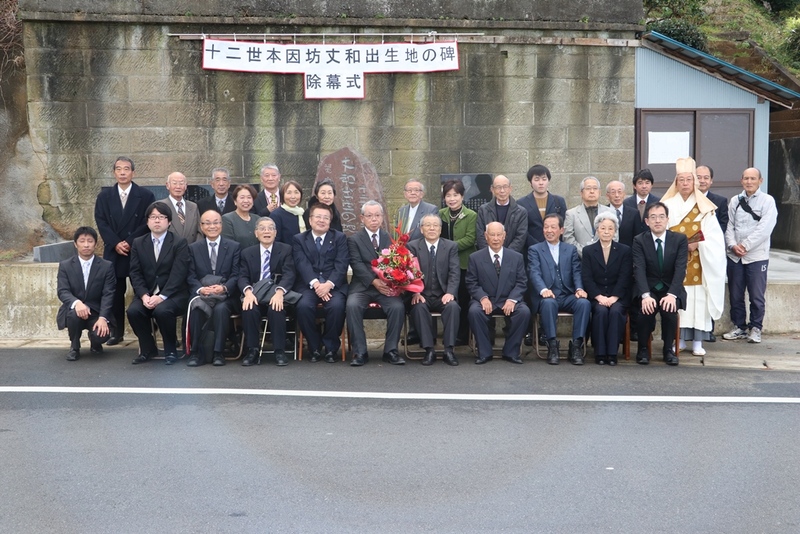 Those involved gathered for a commemoration photo of the monument’s completion. “The Birthplace of Honinbo Jowa, the 12th Honinbo” monument. 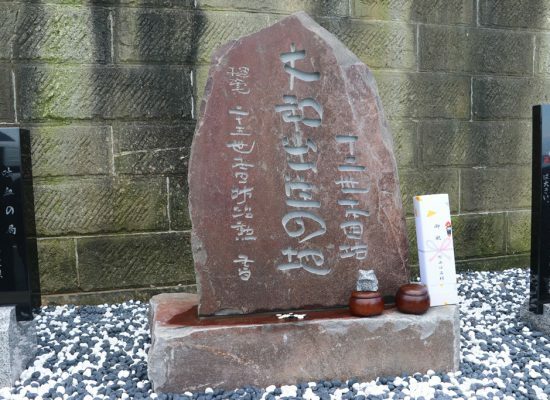 On December 10th, at Nishiura Kisho, Numazu City, Shizuoka Prefecture, “The Birthplace of Honinbo Jowa, the 12th Honinbo” monument was completed, and there was an opening ceremony. The curtain was drawn by 12 guests of honor, led by Mr. Akiho Onuma, the Mayor of Numazu, and the 4 monuments, where one can see Mt. Fuji’s front in the distance, were revealed to the public. As for “The Birthplace of Jowa” monument standing in the middle, its calligraphy was written by Honinbo Chikun, the 25th Honinbo, who inherited the Flow of Honinbo. On its sides are a Go board with a position from Jowa’s masterpiece “Blood-vomiting Game” and another momument to elaborate on the game. After the monument’s opening ceremony, everyone moved to Awashima Hotel (Numazu City) and held a celebration party. It is located on a deserted island named “Awashima” floating on Suruga Bay. It is connected to the mainland via a ferry whose outside features the characters from the Japanese anime “Love Live! Sunshine! !” whose stage is Numazu. 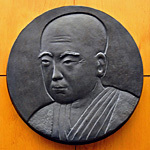 At the party venue, it is revealed that Honinbo Chikun stayed up all night to finish the calligraphy on the monument. Also, few Numazu citizens know Jowa, so the monuments became a new cultural treasure as after-images of the Go past. And fervent they are, for everyone is intent on attracting the attention of Numazu, a Go city , for a long, long time to come.